﻿ Custom Window Coverings | Budget Blinds of Bethesda & Silver Spring, D.C.
At Budget Blinds of Bethesda & Silver Spring, we're your local neighborhood experts that truly understand your needs. We're in your neighborhood, we know the local Bethesda & Silver Spring weather and community, and we’re backed by the #1 provider of blinds, shades, and drapes in North America. Over 25 years of customer satisfaction gives you peace of mind that only comes with choosing the proven leader. We bring the showroom to you in Bethesda & Silver Spring. We expertly measure your space, install beautiful window treatments, and back it up with the best warranty in the business so you can sit back and relax in the beautiful, Bethesda & Silver Spring weather and sunshine. We serve to give you the best in window treatments, so you can rest easy knowing your space will be beautified and optimized with window treatments that fit your individual needs. One of the quickest and easiest ways to transform your living space is to add beautiful new blinds to your existing windows and sliding doors. From keeping the sun's harmful rays from fading your furniture, flooring and furnishings, to keeping glare off the TV and lowing the ambient temperature on a hot day, custom window coverings are as functional as they are inspiring. At Budget Blinds of Bethesda & Silver Spring, we work with you to design and install custom window fittings that perfectly suit your home and personal aesthetic. We have hundreds of styles, exclusive brands and even smart home options that can bring your home fully into the twenty-first century. 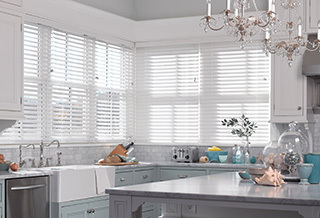 In addition to our collection of window blinds, Budget Blinds of Bethesda can help accent your living space with shutters, shades, drapes and other home furnishing options in all sorts of materials from wood to vinyl, fabric, composite and even aluminum, ensuring that your custom installation will perfectly match your home's decor, or take you in new directions you never thought possible. Starting with a FREE, in-home design consultation and estimate, we bring the showroom to you at home or work and help you select and design the right window coverings for your home. Once you're ready, we install it all and stand behind our work with a five-year, free replacement warranty, so you can rest easy that we won't be happy until you are. Owned and operated by Roslyn Ashford and her team of installation professionals, Budget Blinds of Bethesda & Silver Spring serves the areas of Bethesda, Glen Echo, Cabin John, Silver Spring, Chevy Chase, Kensington, D.C., Takoma Park, College Park and Olney. Located close to our nation's capital, the Bethesda and Silver Spring community is a true four-seasons area with hot summers and cold winters, and everything in between. With an average summer high close to 90 degrees and an average winter low of 25 degrees, the right window coverings can increase comfort and lower energy costs by keeping the sun out during hot summer days and keeping the warmth in on cold winter nights. Roslyn helped me design plantation shutters for my living room and master bedroom. When other companies told me the shutter design I wanted for my door was impossible, Roslyn worked with me to do exactly what I wanted, at a reasonable price, and I couldn't be more thrilled with how everything turned out. Roslyn's professionalism and her positive, can-do attitude made working with her a terrific experience. Superb customer service and a quality product. I highly recommend Budget Blinds for anybody looking for a wide variety of cost-effective, high quality window coverings for your home or business. Roslyn and her installation team provide top-notch customer service. I am very grateful for the professional and courteous service afforded me by Roslyn and her staff members of Budget Blinds of Silver Spring. She was able to suggest solar shades to remedy UV rays from the sun coming through the windows causing the material to fade on the pews at my church. Her assessment was done quickly, the shades were ordered and the installer came and took minimal time to install. They look beautiful, everybody loves them and more importantly, the cost of the solar shades were reasonable and they are doing the job they were purposed to do. I am completed satisfied with their work and would recommend Budget Blinds of Silver Spring to everyone!